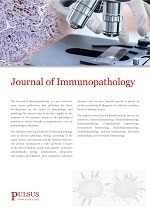 The Journal of Immunopathology is a peer-reviewed, open access publication that publishes the latest developments in the fields of immunology and pathology. The journal aims to provide insights on the response of the immune system to the pathological invasion or attacks towards a comprehensive cure for immunological disorders. The journal focuses on all aspects of immunopathology such as disease pathology, etiology, pathology of the organ system, and immunity and the immune response. The journal encompasses a wide spectrum of topics in the field including: innate and adaptive immunity, autoimmunity, allergy, inflammation, antigenicity and antigen presentation, gene regulation, infectious diseases, and vaccines. Special impetus is placed on studies pertaining to diagnosis of a disease condition, based on immune assays. The subjects covered by the journal include, but are not limited to, Classical Immunology, Clinical Immunology, Immunopathology, Computational Immunology, Evolutionary Immunology, Immunopharmacology, Neuroimmunology, Systems Immunology, Molecular Immunology, and Veterinary Immunology.